The U’s ski archives document events that have made Utah’s slopes the envy of the world. Norwegian skier Alf Engen came to Utah in 1931, and the state—and its reputation as a tourist destination—soon were forever changed. Engen set numerous ski records throughout the 1930s and was a tireless promoter of and advocate for the Beehive State’s powdery slopes. In the above photo, he performs a textbook example of a double-pole turn at Alta, the Utah ski resort where he established a renowned ski school. The University of Utah’s S. Joseph Quinney Outdoor Recreation Archives—known as the Utah Ski Archives—has been documenting the legacy of Engen, who died in 1997, as well as the history of skiing and other winter recreation in Utah and the Intermountain West. 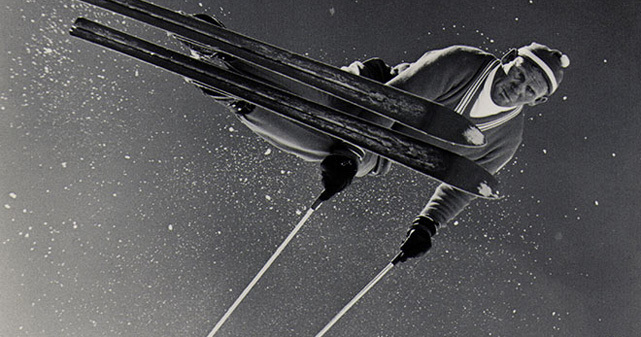 “The Utah Ski Archives is internationally recognized as one of the largest and most significant publicly available research collections on the history of skiing in the United States,” says Joyce Ogburn, dean of the Marriott Library. In 1989, the staff of the library, with financial support from the Quinney Foundation (named for Joe Quinney, founder of Alta Ski Area, and his daughter Janet Quinney Lawson ex’44) began collecting photos, films, oral histories, scrapbooks, business records, posters, books, magazines—anything and everything—about Utah’s ski heritage. Since the archives’ founding, the Marriott Library has had a close and productive partnership with the Utah Ski Archives Board, an all-volunteer group of people who share a love of winter recreation. Every period of Utah history is documented, from old-time mail carriers on eight-foot-long snowshoes to world-class jumping tournaments in the 1930s. Parts of the collection also reflect the founding of Alta, Brighton, Park City, Snow Basin, and other Utah ski areas, as well as the development of snowboarding as a major player in the snow sports industry. Enjoyed the article, as it brought back memories of my father. Being an immigrant from Eastern Europe and an avid skier, there weren’t many job opportunities, but thanks to people like Alf Engen and Junior Bounous, my dad had a part-time job as a ski patrolman at Alta when he came to Utah. Is this all there is to the article? Three paragraphs? With all the rich history of skiing in Utah it seems there would have been more to write. Also where is this archive held in case one would want to view it? Again, certainly there must be more pictures than those selected, which include the same person twice two different times? Very disappointing “article”.